But, that doesn't describe all landscapers! 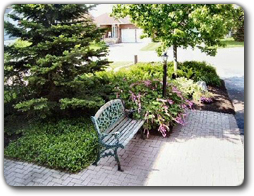 Whether you're looking for a complete landscape makeover… or just a touch-up here and there… Ashbury Landscaping & Consulting, and our over 30 years of satisfying landscape project clients from Ottawa, and all over Eastern Ontario – and our broad range of landscape services – give you a one-stop source for all your landscaping needs. Services like design consultation, fences, arbors and gazebos, gardens, decks and porches, flagstone, lighting, interlock (patios, walks and driveways, steps), retaining walls, water falls & water gardens… to name just a few. When it comes to landscaping your home, you likely have ideas and objectives, and as both a landscape design and landscape construction company, we’ll want to meet with you – on your property – to discuss them with you. Then our professional, in-house landscape designer will shape those ideas into a plan to transform your property into the landscape you’ve been dreaming about. And to ensure your landscape project plan is well-executed through each phase, your designer will coordinate your landscape project with our professional landscape specialists. to ensure you a stunning, more-than-you-were-expecting result. 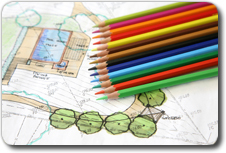 Ashbury Basic Landscape Consultation Service – to give you a good idea of what would be involved in a landscape project, this service includes a 1-hour on-site visit to discuss your needs and review your existing site conditions. If you’re interested, we can leave you with a quick sketch, and then follow-up with a more detailed estimate. Ashbury Full Landscape Design Service – if you already know you're going ahead with landscaping, your landscape designer will meet with you – on site – to discuss your needs and objectives. During this meeting we’ll give you design ideas, an idea of the scope-of-work, and a preliminary budget… and we’ll take measurements and photographs of your property. We’ll return with a landscape project concept plan which will include the overall layout and the main landscape elements. We’ll want to discuss the plan with you in a collaborative way, making any resulting changes. Then we’ll prepare your final plan, including all the details required to complete your project, including a final costing with a breakdown of the elements and stages (that way you could complete your project in phases, if you’d prefer). Then you can sit back and let the Ashbury Landscaping & Consulting team complete your landscape project… no fuss, no stress, no kidding. And before you know it, you’ll be enjoying your beautiful, striking, newly landscaped surroundings.